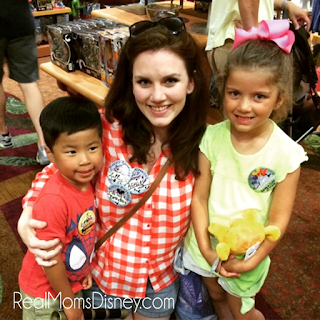 There are so many fun activities and souvenirs at Disney. It can be really hard to choose what you want to do. 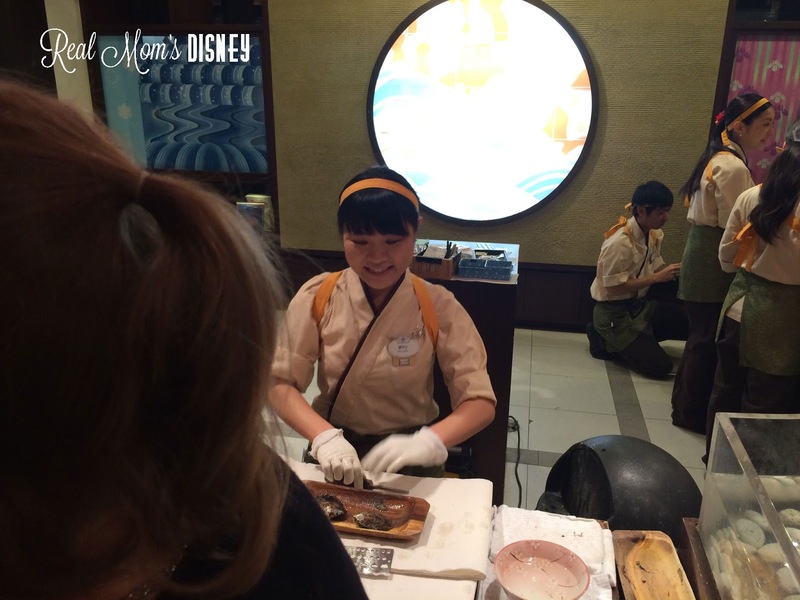 Do you want to purchase souvenirs at the parks or bring your own? Do you want to have t-shirts made? Do you want to ride the hot air balloon at Downtown Disney? We always consider all of the options before we leave for our trip. Since we use our Disney Visa throughout the year, we typically use our reward dollars as our souvenir money. For our last trip to Disney, I wanted to do something different that we hadn’t previously done. 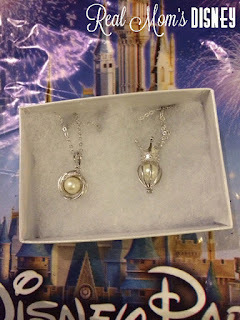 After looking around the DIS boards and perusing some other Disney blogs, we came across Pick-a-Pearl. It looked like a really fun experience and who doesn’t want to come home with a nice piece of jewelry at the end of the trip? 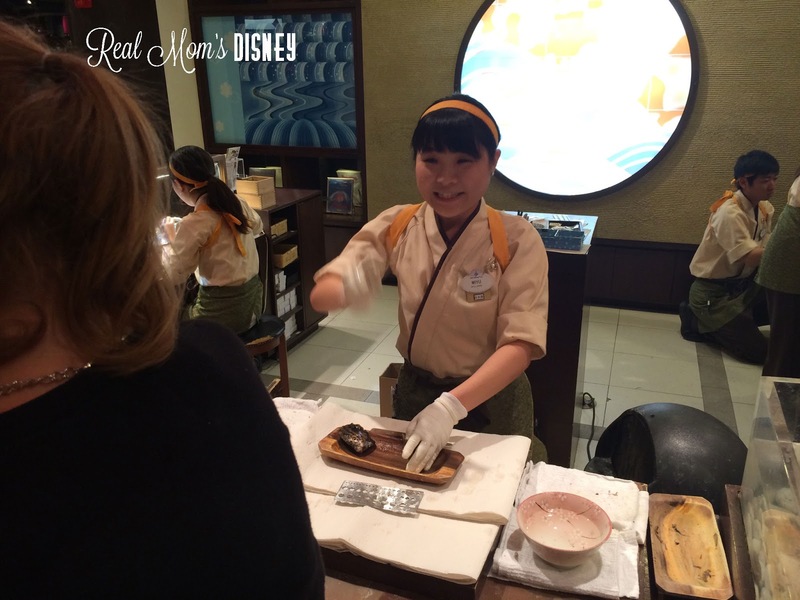 There are four locations at Disney where you can Pick-A-Pearl: inside Mitsukoshi store in the Japan Pavilion at Epcot, Downtown Disney and the Yacht & Beach Club resorts. I’ve read on different blogs that they have a location at one of the water parks, but some say Typhoon Lagoon and some say Blizzard Beach so I’d recommend trying one of the other three places. They are all the same concept, but I believe they are all owned by different companies so the experience might be a bit different at each location. We visited the Pick-A-Pearl at Mitsukoshi in the Japan Pavilion. 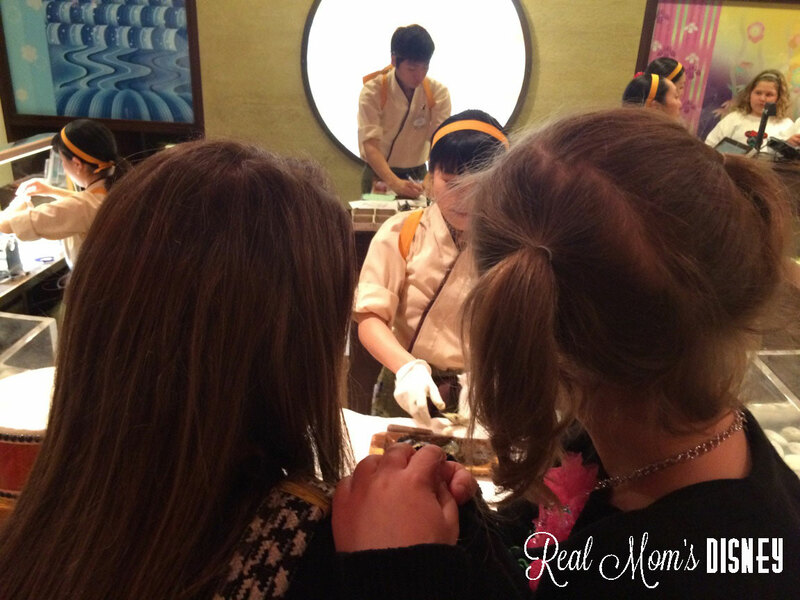 We knew we would have time before our dinner reservation at Teppan Edo (review coming soon!) so it was the perfect time and location to try something new. We arrived about an hour before our reservation and walked around the whole Japan pavilion before we went to the Pick-A-Pearl counter. 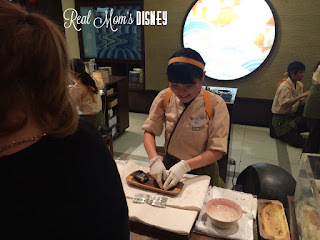 When you arrive at the counter, and just be forewarned – if you are visiting the one in Japan, it can be quite busy, visit the register and let them know how many oysters you’ll be picking. We picked two, one for me and one for Anniston. Pay for those and they will give you a number. 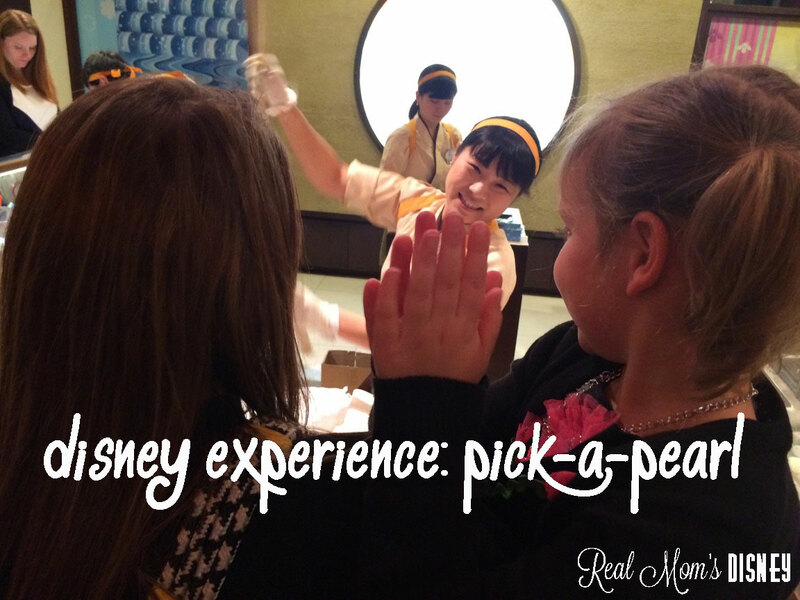 Waiting time will vary by the time of day and the number of customers that are also there to pick-a-pearl. Once they call your number, you step up to the counter and you choose your oyster from the oyster tank. There are tons to choose from. We just randomly picked ours but I’ve heard that people are more likely to get a pretty pearl or a set of twin pearls from the grayest, ugliest oysters. When they have your oysters, they make a big deal about opening them – think chanting and drums and such. Then they make an even bigger deal about the size, color and cleaning of the pearl. 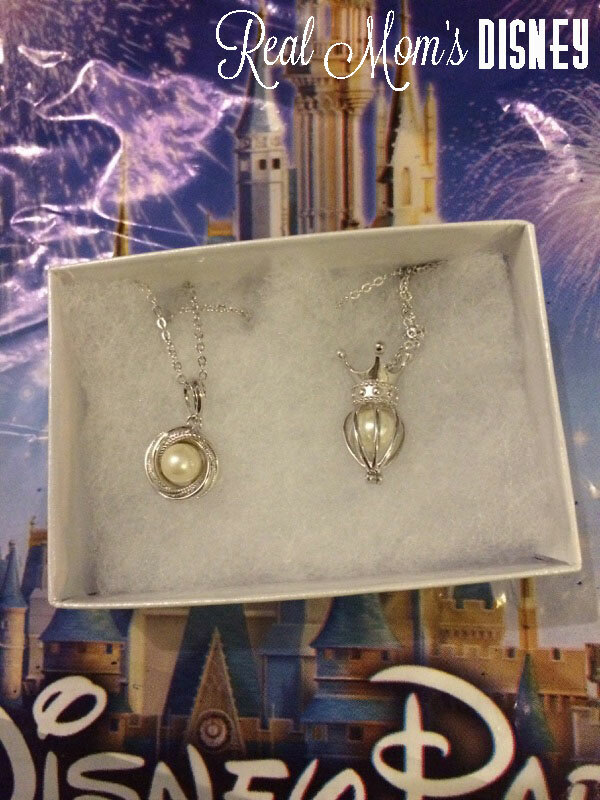 If you want to have them set into a setting, after you receive your pearls, you check out for that separately. Anniston and I each had our pearls set into a necklace. Just remember, if you have them do it (if you bring your own setting, you’ll have to do it yourself. They won’t set it into your own jewelry.) you’ll have the cost of the setting, plus if you are getting a necklace the cost of the chain. Before we went, I had no idea that you could pre-buy settings online. I definitely would have done that if I had known. It took about an hour to set the pearls. We left for our dinner reservation and they were completed by the time we were finished with our meal. For two pearls, two necklace settings and two chains, I believe our total cost was around $120. Not terrible but we could have definitely saved some money by ordering the settings and chains online. It really was a fun experience. It’s one that we will most likely repeat each time we go. I wear my pearl necklace at least once per week, sometimes more. It’s my favorite souvenir that I’ve brought home by far. I’d recommend this experience for people of all ages – boys included. They might not care about the actual pearl, but it would be a fun experience for them. And, hey, maybe they’ll just have something made for mommy! You’re going to Disney! You know what day you arrive and what day you depart. 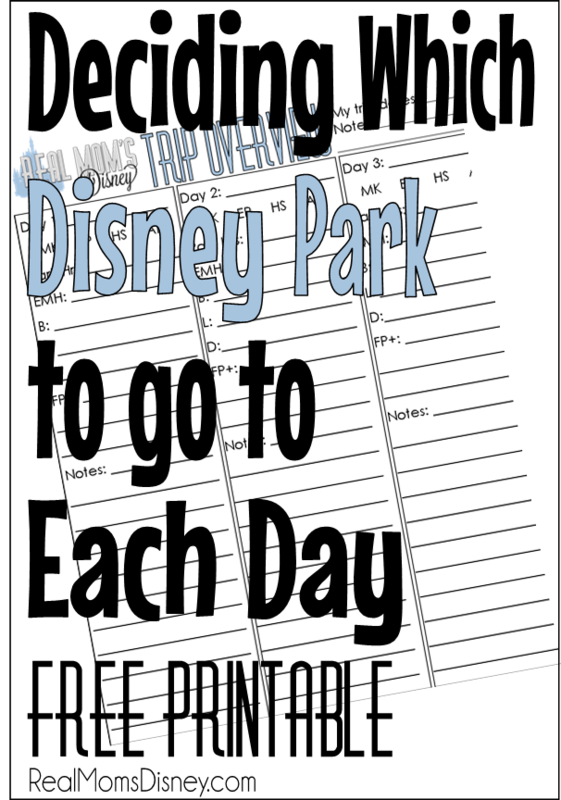 But how do you decide which park to go to on what day? Water parks? Rest day? Good questions. Utilizing a crowd calendar is the best way to decide which park to go to each day. Jenna wrote about utilizing crowd calendars here. If you Google Disney Crowd Calendars, you’re going to find quite a few to choose from. And guess what? Not all of them say the same thing! Do yourself a favor and rely on a few tried and true crowd calendars. My favorites are from EasyWDW, Kenny the Pirate, and WDWPrepSchool. They’re the calendars I rely on when planning our park days. They let you know what kind of crowds to expect, what special events are going on at each park, park hours, and the fireworks/parade schedule. Planning out your park days is important. It gives you a basis to go off of for the rest of your planning. It’s very difficult to make ADRs if you don’t know which park you will be in, and it’s impossible to make the best of your FP+ selections. Check out the crowd calendars, and do your best to be in the “recommended” parks for each day. If you can’t avoid being in a “non-recommended” park, you’ll still be ok – just be sure to make a good touring plan and use your FP+/FP wisely. I’d also recommend making sure you’re there before/at Rope Drop. Most importantly, keep your family’s needs in mind as you plan. For our upcoming trip, I sat down with my husband and we laid out the schedule we thought we wanted. Then, when park hours and crowd calendars came out for our trip month, we went back and re-evaluated. Due to some of the park recommendations, we swapped two of our days. Not a big deal since we had not yet made ADRs or FP+ selections. I personally think this is the toughest part of planning a Disney trip, mainly because where I want to be and what might be recommended aren’t always the same thing. I also like to leave a little wiggle room in our touring in case we find something new we enjoy and want to go back to. If you couldn’t already tell, I’m not a huge fan of the great unknown, so that part makes me twitch just a little. But I usually end up being glad I planned that way, even if it does drive me crazy in the beginning. Like I’ve said before, I plan best with a pencil in my hand and a place to write things down. So I created a Trip Planner, and it’s available to download for free! I used it while planning our trip, and I liked the list format to help me remember all the details I needed for each day. We have three formats – 3-day trip, 5-day trip, and 7-day trip. You can use one or a combination to suit your needs, whether you want to use it for only your park days or your entire trip. 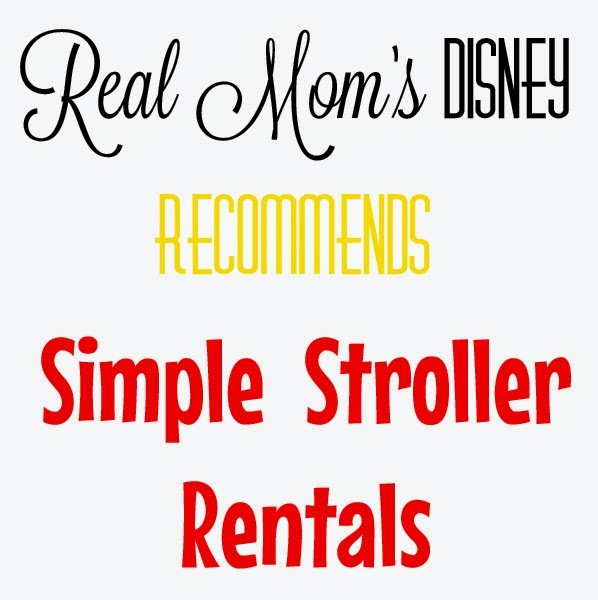 It’s our goal at Real Mom’s Disney to help you plan the best trip you can for your family. And we’d love to hear from you! How do you like to plan your park days? If there's one word that I WOULDN'T use to describe myself, it would be "spontaneous." I'm a planner through and through, almost to the point of detriment. I thrive on researching and having a plan, and this is especially true for our Disney trips! Lots of people ask me for advice for Disney vacations, and without hesitation I say "HAVE A PLAN!" So when our family was planning a trip to Jacksonville, FL to visit my brother, the thought briefly crossed my mind about possibly doing a Disney day. "No," I eventually concluded, "It would just be too much. And the heat and crowds would be miserable!" Well, a few weeks went by and my sister brought it up. Maybe we could swing it? Ultimately, when I thought of being just 2 hours away from Disney World and not going, it KILLED ME (this would be one of the signs of addiction). 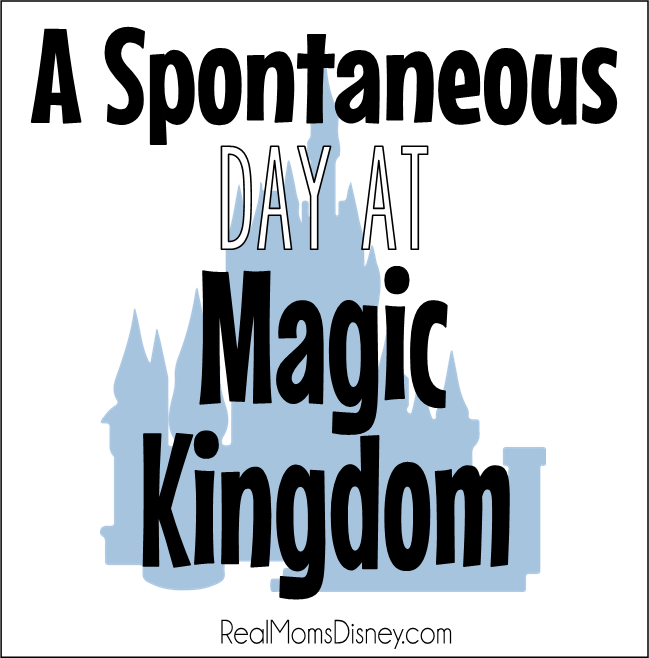 The next thing I knew, I made the spontaneous executive decision that we would do one day at Magic Kingdom with my mom, sisters and Evy and Liam (ages 6 and almost 5). So here's what happens when a Disney Addict gets an unexpected fix: you go into CRAZY EXCITED PLANNING MODE. Only problem: We were only about 3 weeks out! I'm usually the one who takes a full year to plan, make reservations, etc. But it was actually very freeing to have such a simple process. I went online and bought One Day Magic Kingdom tickets. No park hopping, no bells and whistles. I DID pay for expedited shipping, because the shipping time was iffy. I probably would've been safe, but Disney quotes around a 12-day shipping time. You can also elect for Will Call, but I didn't want one more thing to worry about that morning (and as I'll explain in a minute, that was definitely a wise choice!). I knew our day would only be successful if we could schedule some Fast Passes, but I usually book my Passes at the 60-day mark (I believe it's 30 days out for non-resort guests). I just KNEW they would all be gone. I also didn't understand how it would work for me to link Fast Passes, but it ended up being so easy! I have an account at DisneyWorld.com, which is called "My Disney Experience" (MDE). I logged in to this account and simply added the tickets to my cart that I wanted to buy. Once I purchased them, they immediately showed up in my MDE account on the website (even though the physical ticket cards were being shipped to me, the "digital" version (if you want to call it that) was linked to my account right away), so I was able to make Fast Pass reservations right from my computer! My plan was to hit Fantasyland right at opening time and knock out all of those rides (including Peter Pan first, which is the most popular in Fantasyland). I wanted to use my Fast Passes in other "lands" that we wouldn't be hitting in the morning. The one exception was repeating Peter Pan in the afternoon, because we all enjoy it so much! Some people reserve Fast Pass times for early in the day so they can try to go to a kiosk and get more passes (you can try to reserve more AFTER you've used your allotted 3). However - I have never used this plan. I might try it in the future, but after seeing the lines at the kiosks (they were a MILE LONG), it just takes up valuable time to try and get more reserved. Once my Fast Passes were reserved, I needed to figure out what I was going to wear! Our family always goes to the World in winter - low crowds, great temperatures! I have been so used to wearing pants and mid-weight shirts that I had to totally rethink my park outfit! I don't do great with heat, so I really wanted to be wise in my choices. 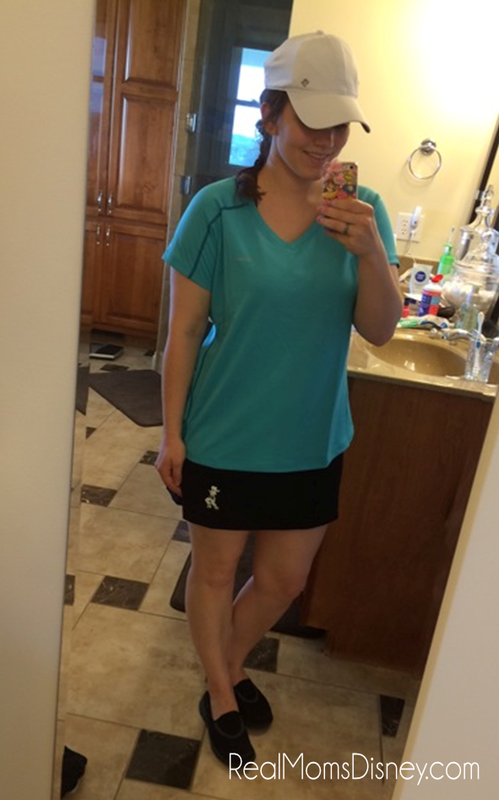 After researching, I chose the Columbia Zero Rules short sleeve shirt with Omni Freeze technology, the RunningSkirts Athletic Skirt with Shorts, the Columbia Women's Coolhead Ballcap III, and my Skecher Go Walks (original model). 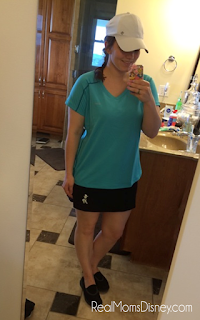 I knew I wanted a loose fitting shirt, and a skirt with built-in shorts to avoid chafing. I tried everything on and really liked the look! The one thing I forgot were some items for breakfast! We decided to drive in from Jacksonville the night before Disney Day and stay in an off-property hotel. This way we wouldn't have to wake up at 3am! We also decided to hang out at Downtown Disney when we got in to Orlando. Here are some thoughts/highlights of how the day went! -Orlando traffic is NO JOKE. We are so used to flying in and taking the Magical Express, and traffic definitely affected the magic for awhile there! Ha! Our trip should've taken about 2.5 hours and it took closer to 3.5. -Downtown Disney construction is NO JOKE. My GPS was all but saying "WHAT THE HECK?" We finally got into a parking garage and were able to start walking around. It was very crowded, but we managed! I even got my Birthday Button (I've always wanted one! ), and it was a blast! -We stayed at the Renaissance Hotel in Hotel Plaza, and it was great! We were able to sleep the 6 of us and it was very comfortable. However, getting to the Ticket and Transportation Center the next morning was very frustrating. Again, my GPS just didn't take us where we needed to go, and we ended up driving through the back roads of Disney corporate offices! It would've been interesting if we hadn't been trying to get to the parks early! We finally got to the TTC parking lot and had to take the ferry to Magic Kingdom (the monorails weren't operating yet). We walked up to the gates of MK right at 8am (when the park was set to open). We missed the Welcome Show and I was so worried that we were already behind the 8 ball, as they had already opened the park and we missed the initial push of people. However, even with walking in at 8am and stopping at Starbucks for a quick pastry and coffees for my sisters, we walked into an almost-empty Fantasyland! I'm telling you, the masses of humanity DO NOT arrive at the parks until about 2 hours after opening! It's crazy! -We hit Peter Pan first, and then went around to every ride in Fantasyland, including Small World, Winnie the Pooh, Barnstormer, Dumbo, and Under the Sea with NO WAITING (maybe 5 minutes at maximum!). We were even ahead of schedule! 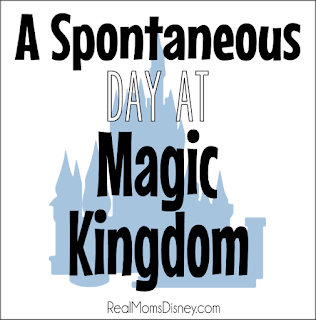 -We ate lunch at Columbia Harbor House and then headed over to Adventureland. We did the Tiki Room (air conditioned!) and then our first Fast Pass, the Jungle Cruise. Even with a FP, we had to wait about 15 minutes. However, compared to the 55-minute Stand By wait, it was a breeze! -We did PhilharMagic (air conditioned!) and then repeated Peter Pan with our Fast Pass. The lines in Fantasyland were LONG by this point. We walked by Enchanted Tales with Belle and the posted wait was only 25 minutes (which is very low for that experience at that time of day), so we hopped in the Stand By line. I considered this optional, so it was a nice treat! -We headed over into Tomorrowland and got a little ice cream snack. Then we hit Carousel of Progress (air conditioned! ), PeopleMover (otherwise known as Tomorrowland Transit Authority), and then used our Buzz Lightyear Fast Pass. -By 3:30pm, we had completed our plan! We hit our highlights and never waited more than 25 minutes for anything. I couldn't believe that on a hot summer day with a crowd level 8 out of 10, we had such an easy, non-stressful day! The key is arriving early, utilizing Fast Pass, touring efficiently, and prioritizing what's important to you! -We browsed on Main Street for awhile, and then a thunderstorm rolled in. We had planned to stay in the park for an early dinner, but we looked at the radar and knew this was going to be a big one. We also wanted to take advantage of being so close to the entrance, so we put on our ponchos and decided to call it a day! -We braved the torrential rain and rode the monorail to the TTC, where we took a tram to our car. Mercifully, the rain sort of lessened as we were walking to the car. Unfortunately I was in terrible traffic and HORRIBLE weather driving back to Jacksonville. But we arrived back to our condo safely! Overall, it was a WONDERFUL Disney Day! It was an unexpected treat, and it was encouraging to me that you can have such a wonderful time on very little notice. Once you adjust your expectations and do a little prep work, it can really be a full and happy day!